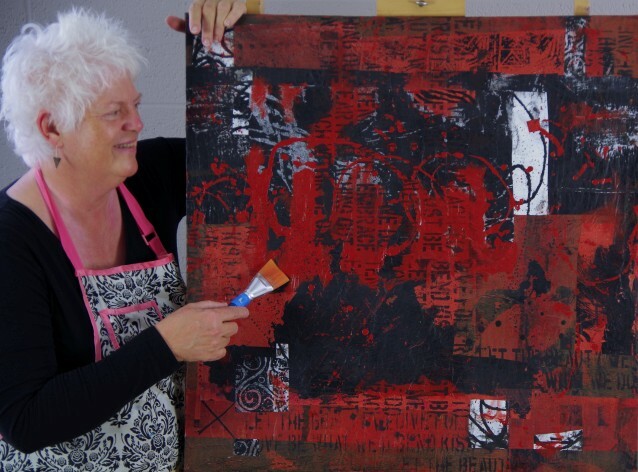 Digging deep into the human drive to create what we need to see, Kathleen Mooney uses signs and symbols, color and mark making, Neolithic art and archaeology to form thoughtful and thought provoking abstract paintings. “My art centers on the crossroads of imagination and memory. The lyrical abstractions, signs and symbols, mark making and colors are composed and arranged for maximum effect – the goal centers on balance, harmony and energy. Printmaking figures in many of my works – it is the best way to create my rich multilayered surfaces”. Mooney gathers inspiration from her regular trips to the Atlantic coast of Northern Europe where Neolithic and prehistoric remains are highly concentrated. The coastal landscapes present endless fascination to the artist. Mooney enjoys exploring the Great Lakes, the American Southwest, and US coastal regions. She describes her artistic education as “a la carte” – “I use the often-challenging balance of time and money to study what I need when I need it” most often now as Artist in Residence retreats - a powerful catalyst for painting and discovery. In 2017 Mooney launched her "Independent Traveler Art" workshops in Ireland and locations of stunning beauty in North America. "I know from my own artist in residency experiences that spending quality time in iconic locales with a focus on painting, sketching and photography is a powerful immersion for my art practice and career advancement". Mooney is a signature member of National Watercolor Society, the International Society of Acrylic Painters, and the International Society of Experimental Artists. Recent exhibitions: H2OMG - The Mukenthaler Cultural Center, Fullerton, CA: Pier Arts Center, Orkney, Scotland: Big ARTS on Sanibel Island, FL: Forest Hills Fine Art Center in Grand Rapids, MI: National Watercolor Society, San Pedro, CA: ISEA/NWS CA/Wales, UK: NWS / China Exchange with a tour of 5 museums in China and CA. In 2014 Mooney’s painting “Maize, Smoke and Gourd” received a Finalist Award in The Artist’s Magazine 30th Annual Competition - selected from a field of over 7,500 entries world-wide. In 2017 Mooney’s painting “The Dock” received the Grand Prize at the North Coast Plein Aire Competition. In 2017 Mooney was selected by "Watercolor Artist" magazine as one of their annual "5 Talented Artists to Watch" featuring a 2-page spread of paintings and interviews. Her art is featured in the “Legends” Collection produced by Foreign Accents Rugs and has been exhibited at the world’s largest home furnishings market – High Point Market.